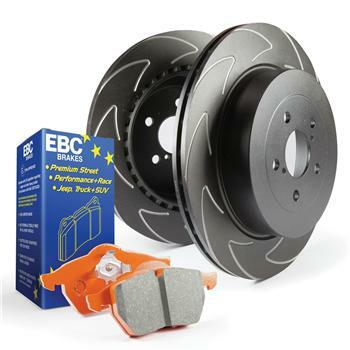 EBC Brake Kit - S7 Orangestuff and BSD Rotors RAM - Dezod Motorsports Inc - Home of the automotive performance enthusiast since 2002. Get everything you need with this quality Orangestuff brake pad and rotor kit which includes pads, BSD rotors and caliper lube. As with the Bluestuff pads Orange grade pads once bedded are safe for street driving on your way to a track event. Lifetime is longer than Bluestuff grade but again must be regularly monitored especially if driving home on these brakes after track use.